BROWNSBURG, Ind. 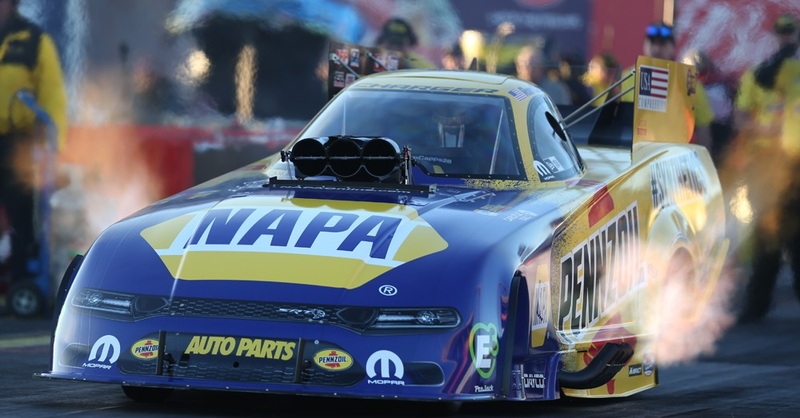 (July 1, 2016) – Ron Capps and the NAPA AUTO PARTS Funny Car team could not have picked a better time for an astounding four-race, four-week run in the NHRA Mello Yello Drag Racing Series. Don Schumacher Racing’s NAPA AUTO PARTS Dodge Charger R/T team led by crew chief Rahn Tobler and assistant Eric Lane started the recent Eastern Swing ranked sixth in championship points, but after winning three of the four Eastern Swing titles with a 14-1 record in eliminations they have taken over the points lead with a 130-point cushion at the midway point of the 24-race season. 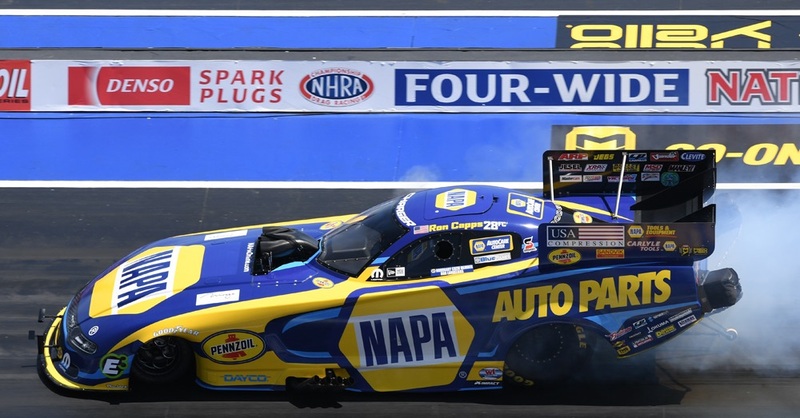 Capps won three No. 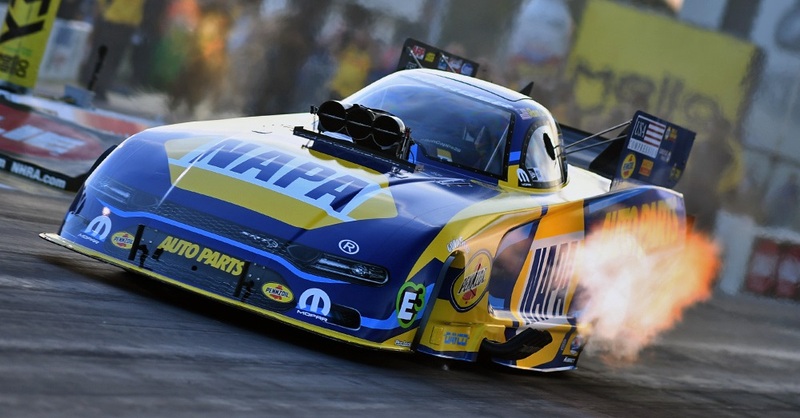 1 qualifying positions during the Swing with 27 of his 32 runs in the 3-second range including all eight in each of two events, which had never been accomplished before in NHRA. 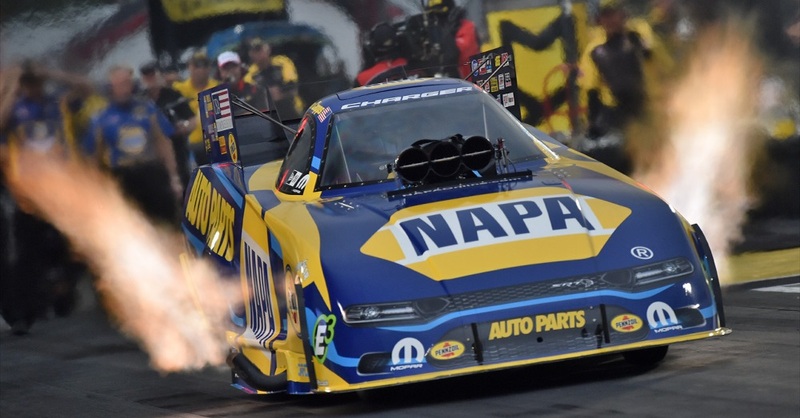 “We have been on an incredible run and there couldn’t be a better way to help kick off NAPA’s fifth annual ‘Get Back and Give Back’ program to support the Intrepid Fallen Heroes Fund,” said Capps, who also won his three straight No. 1 qualifying positions to open the Swing. The “Get Back and Give Back” effort by NAPA and its customers raised $2.1 million last year and a total of $5 million since 2012 to help the Intrepid Fallen Heroes Fund support U.S. military personnel and families affected by traumatic brain injury (TBI) and post-traumatic stress disorder (PTSD). And NAPA/Intrepid Fallen Heroes Fund T-shirts and bracelets can be purchased for $15 at NAPAonline.com. All proceeds will benefit the Intrepid Fallen Heroes Fund. To boost awareness for the Intrepid Spirit Centers, Chase Elliott, driver of the No. 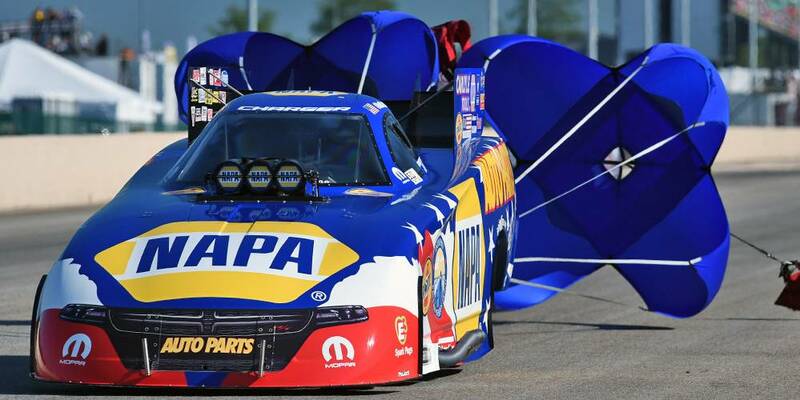 24 NAPA AUTO PARTS Chevy SS for Hendrick Motorsports, will feature a patriotic paint scheme at the July 9 NASCAR Sprint Cup Series race at Kentucky Speedway.